Erlton Park on 25th Ave SW experienced significant damage during the flood as well as during the repairs to the Scollen Bridge. Residents have expressed an interest in seeing the park rehabilitated to its pre-flood condition and many are also interested in enhancing the community space. The ECA is working with City of Calgary Parks to rehabilitate the park by replacing benches, fences and repairing or re-sodding the grass. We are in the initial stages of park enhancement. The follow chart illustrates the ongoing process. 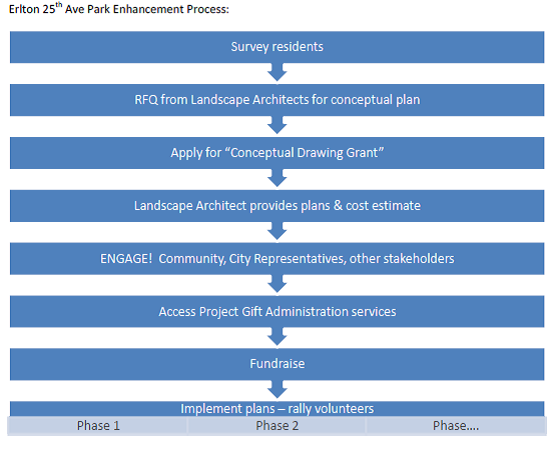 If you are interested in being a part of the park enhancement project, please get in touch with our Parks Director.